When I was growing up, breakfast for dinner was always reliable when my mom was overdue for a trip to the grocery store. I knew it meant that we probably didn’t have another meal option, but I never minded. Bacon and eggs, pancakes, or French toast at any P.M. hour felt like breaking the rules, and I always considered it a special occasion. The more I delved into the world of food and discovered how much I really loved making things in the kitchen, I realized cooking is a passion that has very little to do with following any rules. Sure, there are explicit methods of cooking that involve specific measurements and precise temperatures; however, when it comes down to producing flavor, it really requires inventiveness and experimentation. Breakfast meals have made their way into my dinner routine, and I’ve successfully attempted breakfast sandwiches, breakfast casseroles, and even breakfast pizzas past the morning hours. My latest success story is another perfect method of translating breakfast items into a hearty dinner. 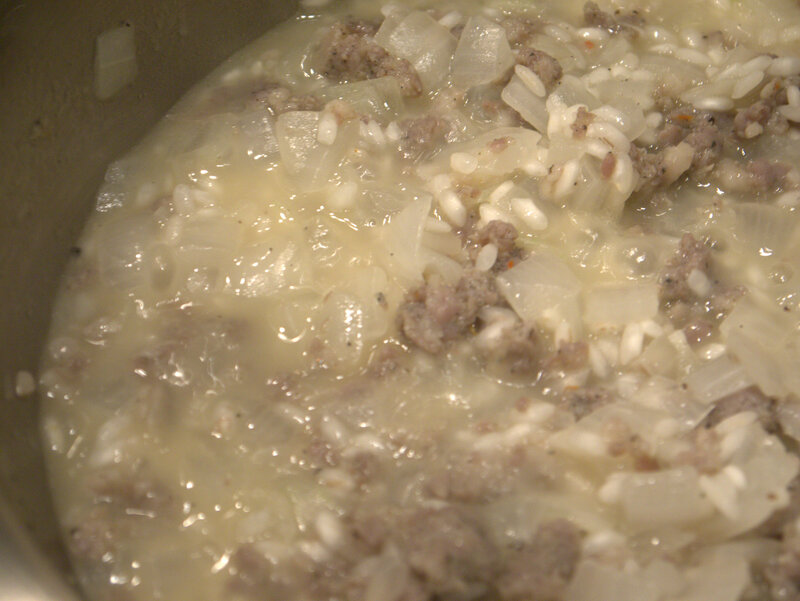 In a heavy pot, melt butter over medium heat and add sausage, breaking up with a spoon. 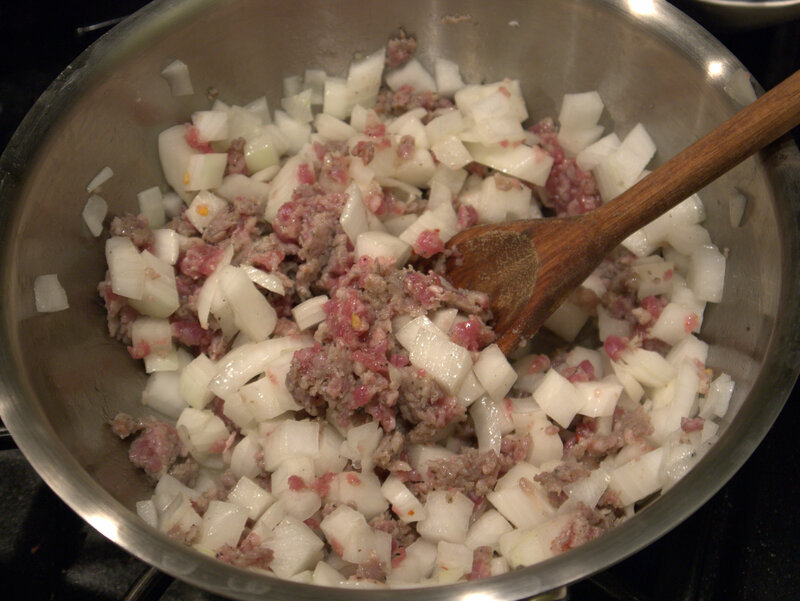 Add onions and cook until translucent and sausage is cooked, about 7 minutes. Add the rice and stir to coat in the juices. Pour in the wine, stir rice mixture, and allow liquid to evaporate. Decrease heat to medium-low and add chicken broth, one cup at a time, stirring often and allowing liquid to evaporate between each addition. Cook until rice is tender, approximately 20 to 25 minutes. Stir in cracked black pepper and chives. Top each serving with Parmesan cheese and a poached egg. The middle stage of risotto cooking. Risotto is always a good idea. 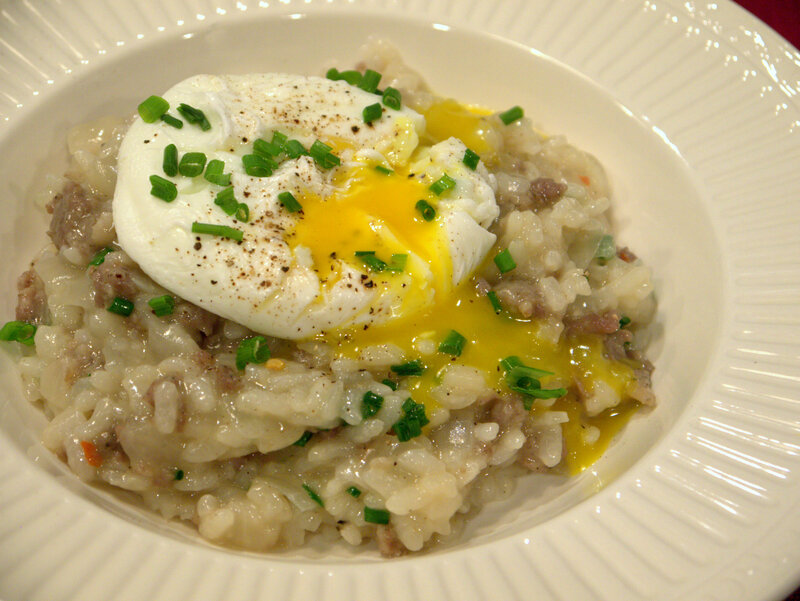 It’s a comforting, creamy rice dish that’s just as impressive as it is easy. It can serve as a starchy canvas to a host of other ingredients and it gracefully absorbs much of the flavor of the things it’s cooked with. Coaxing the granules into an exceptionally al-dente dish seems like a labor of love; risotto dishes require attentiveness and patience, and the constant stirring not only aids the rice into sucking up the liquid, but also prevents it from sticking to the bottom of the pan. One of the benefits of using sausage is that it doesn’t produce grease in the same way that other breakfast meats do and it sometimes comes already seasoned with herbs and spices. Since it’s ground, it evenly and appropriately disperses throughout the rest of the dish. Fresh chives add brightness in both color and flavor, and the rich, velvety contents of a poached egg spill out onto the already decadent dish. The only real rule of risotto applies to the addition of liquid in order for the rice to cook. Other than that, feel free to try this with a different meat, different herbs and even different veggies.